Fire chiefs have called on wedding planners to think twice before releasing sky lanterns after highlighting that they have been responsible for a "catalogue of destruction" since seeing sales rise to 8 million per year in the UK. 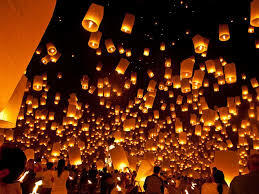 Annually, more than a quarter of a million weddings take place in the UK, and with the popularity of releasing the Chinese lanterns to mark the day increasing so has the risk of them setting property and crops alight, killing farm animals and wildlife, and to air traffic and shipping. The Local Government Association (LGA), which represents all 49 fire and rescue authorities in England and Wales and over 370 local councils, is calling on people to think twice about the dangers of releasing sky lanterns. Cllr Jeremy Hilton, Chair of the LGA's Fire Services Management Committee, said: “The potential for sky lanterns to endanger people’s safety, their property and their livelihoods is considerable, and it is understandable why so many councils and other organisations have banned their use as far as they are able. “Fire authorities across the country are united in calling for people to think twice before releasing what is essentially a ball of fire. At this time of the year fields are full of tinder dry haystacks, more people’s homes are empty as they are away on holiday, and wildlife is in abundance. “Unfortunately it is also exactly the same time of year that weddings, outdoor parties, festivals and barbeques are at their height, which is why we are asking event organisers and anyone celebrating to resist the temptation to release sky lanterns”. In June 2013, 100,000 tonnes of recycling material in Smethwick, West Midlands, was set alight by a lone sky lantern. The resulting inferno took 200 firefighters three days to extinguish using 39 fire appliances. Surrounding roads, businesses and a school were closed, and the total cost of the damage was estimated at £6million. The Department for Communities and Local Government (DCLG) has produced a ‘model’ by-law to help councils ban the release of sky lanterns on council-owned land and at licensed events. A total of 25 councils in England, including Hampshire, Essex, Oxford and Birmingham councils, and the majority of Wales’ 22 local authorities, have already banned them. The inherent dangers sky lanterns present have also persuaded retailers such as Tesco and Poundland to stop selling them and venues such as Knebworth House and the Glastonbury Festival to outlaw their release. Two years ago a report compiled for the Department for Environment Food and Rural Affairs (DEFRA) estimated that between three and eight million lanterns are sold each year in the UK. It concluded that, 'the fire risk associated with the use of sky lanterns is significant'. · a cow that died when the wire from a sky lantern punctured her oesophagus after ingestion. Police and coastguards also suffer a loss of resources whilst having to deal with lantern sightings being mistaken as something else such as a distress flare. To find out more about the LGA campaign visit www.local.gov.uk/fire-and-rescue-services.